Jaundice and Kale Bland are sisters, each with a particularly routine and unextraordinary life. They live alone because their parents have gone off to run an errand, and have not come back. One day their lives turn upside down when they are abducted by a motley crew of female pirates. When they are forced to scrub the decks and none of their very limited dealing-with-danger tactics work, the sisters must find a way to locate their parents and live to tell the tale. 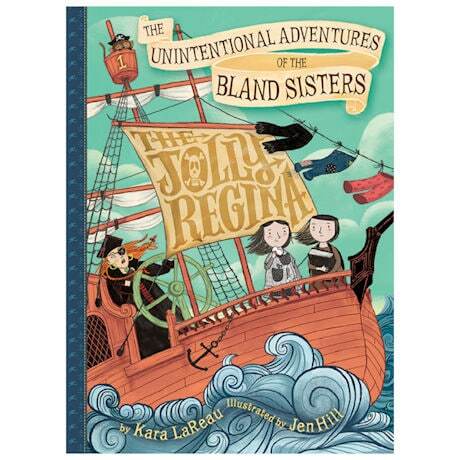 The Unintentional Adventures of the Bland Sisters: The Jolly Regina is a heartwarming story with a funny, quirky plot. There were a lot of positive messages, and the sisters and the pirates were intriguing characters. I also enjoyed how the author put a vocabulary word and definition at the start of each chapter. A quick and rather easy read, this is a lively story with a good heart—perfect for younger audiences (ages 8 to 12)!